Shipping costs for assembled battery modules such as SYBTU1-PLP need to be verified with a customer service representative. The shipping cost on the website is calculated using regular Ground shipping rates while these modules must be shipped on a pallet. Therefore please call for a free quote for any quantity as the shipping cost shown on the website is subject to change. Our APC SUVTR30KG4B5S Replacement Battery Unit is a Plug & Play Replacement unit which consists of 32 X 12V 7.5AH Brand New Batteries assembled in 4 original refurbished SUVTR30KG4B5S cartridges. The batteries inside the Replacement SUVTR30KG4B5S unit are 32 SigmasTek 12V 7.5AH batteries. You can read our quick Battery Buying Guide to learn more about important battery characteristics. If you need more help purchasing APC SUVTR30KG4B5S - Replacement Battery Unit, please call our customer service department at (800) 657-1303 or e-mail us. Our experienced and knowledgeable staff is ready to assist you. For larger orders and quantity discounts please fill out our Get a Quote Form. 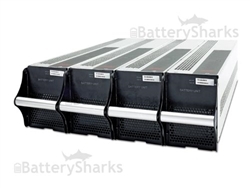 Buy your APC SUVTR30KG4B5S - Replacement Battery Unit with confidence today! You get superior long life batteries and the best price on the market. Orders for in-stock items are typically shipped within 24 hours. NOTE: This is a Rechargeable Sealed Lead Acid (SLA) Battery. The picture shown above is for illustrative purposes only. Do not hesitate to contact us if you need more information about the availability of a specific brand.